We arrived in Helsinki, Finland at 7am and had to leave by 12:45pm. Before we set foot on land, we felt gypped by this schedule. We were really looking forward to touring this city of 590,000 people. Our original tour was cancelled, so we turned to the travel book. Suomenlinna, a sea fortress, was a UNESCO World Heritage Site, but it required a 15 minute ferry to the 6 islands and four hours according to Fodor’s. As such, we opted for the other popular sites in Helsinki…Senate Square and its green domed cathedral which towers above the city, the Olympic Stadium constructed for the 1957 games, the Sibelius Monument, Temppeliaakio Church which is carved into the rocks, the Esplanade and its Havis Amanda statue, and finally the local market. Overall, we felt like we walked miles and hardly saw a thing. We had to start so early, the market wasn’t set up yet, so we chose to catch it on the way back. The Senate Square was empty and the church wasn’t open yet. The esplanade was vacant. We got to the rock church by 9am to find it opened at 9:30 so we continued on to the Sibelius Monument. We joined the rest of the tourists, mainly Asian, in admiring the statue that resembled a pipe organ. 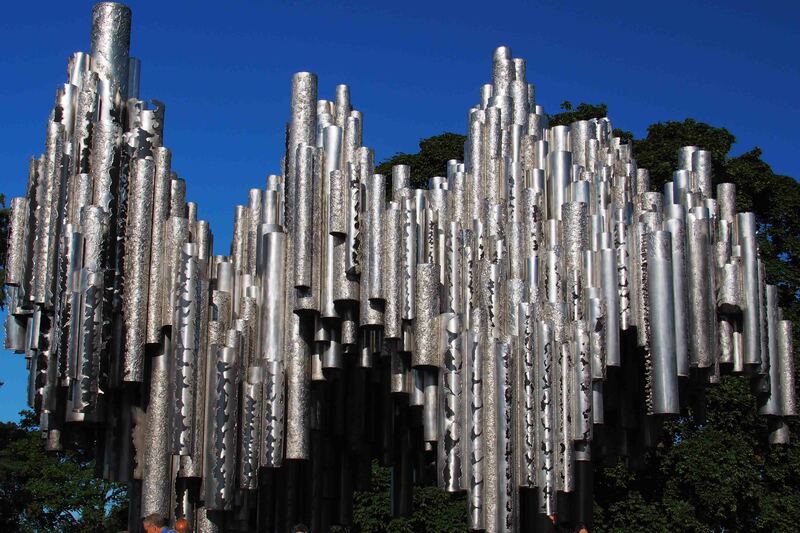 Apparently Sibelius is a very famous composer…at least in Finland. There was no chance in taking a picture without someone in it, so we snapped a selfie and continued on to the Olympic Stadium which at first didn’t appear terribly exciting. For five Euros, however, we took the tiny elevator to the top of the tower and enjoyed a nice view of the city as well as the Olympic Complex. We could see our boat docked by the Ferris Wheel in the distance, and we caught a view of the Olympic diving pool. It was also nice to stop walking on the cobblestones for five minutes. We were bound and determined to see the rock church since it is one of Helsinki’s main attractions. The inside wasn’t much better than the outside which was under construction. The round church cut into the stone was packed with masses of people. We were in and out of there in a few minutes. It was time for a beer at Kappeli, a popular Finnish establishment in the Esplanade. This was nice. We finished the day walking through the market full of excellent produce and souvenirs. Suman found her magnet (one from every country she visits). Since we hardly set foot inside a building since we were in Helsinki, we aimed to see Uspenski Cathedral, the largest Eastern Orthodox Church in the Western World, but it was closed on Mondays along with all the museums. Previous Post Loved Tallinn, Estonia!